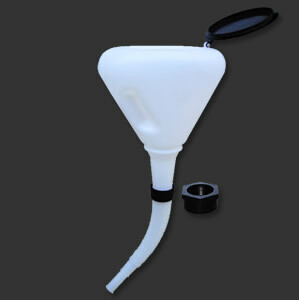 SAE Products® 1.7 liter (1.7 quart) funnel allows spill proof / splash proof transfer of media with an innovative curved rim design. Complete with spout cap and wire mesh screen to keep contaminants out. Features heavy duty translucent polypropylene construction, flexible spout, protective spout cap and lid, and raised quart / liter measurements on outside conatiner. Made in The USA.